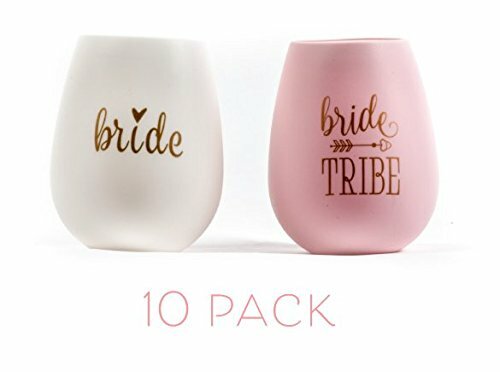 This 10-piece set includes 9 pink bride tribe silicone stemless wine glasses and 1 white bride glass with gold script.These unbreakable, reusable, and portable gifts will be a lasting reminder of this special milestone. Our silicone wine glasses are easy to wash and dishwasher safe and can be enjoyed over and over again. 10 PIECE SET includes 9 bride tribe wine cups and 1 bride wine cup. REUSABLE silicone stemless wine glasses can be enjoyed over and over again. GOLD-TONE SCRIPT adorns each bride wine glass and bride tribe glasses are pink with gold script. UNBREAKABLE AND SHATTERPROOF so your bride tribe can take these anywhere. PORTABLE and flexible silicone wine glasses are perfect for wine on the go. If you have any questions about this product by Samantha Margaret, contact us by completing and submitting the form below. If you are looking for a specif part number, please include it with your message.